LDS Living listed their top 5 John Bytheway clips, I thought I would share my favourite of them all. I agree with the author that these myths need to be blown away. For me, all of these boil down to not treating someone who is autistic as an individual person, or as a human being, period. If we would get to know someone with autism, and I mean truly get to know them, you would see they are an individual, who has feelings, who wants relationships, who can communicate and can accomplish a lot of things. I have been frequently told that the population I work with is only a portion of the actual world, and that the families I see are of the 10% that are experiencing mental health concerns, typically in their children, and that not all families are going through this kind of experience. And that those other families are normal. But then again what is ‘normal’? Is a normal family the family where dad works 9-5, mom stays home and children are graceful and obedient? They eat dinner together each night and have family activities together? They are able to pay the bills and put their children in activities? Well, it turns out that the ‘normal’ family, or the ideal family for some, is actually abnormal in our society. If we judged families by what we would consider the ideal, 96% of families would be considered dysfunctional in some sort of manner, making 4% of families living the ideal family lifestyle. The definition of normal as a noun is something that is the average, usual, or typical. Why is it that what we consider normal in a family isn’t actually the usual family, the typical family or the average family? Why do we strive daily for a dream that some of may not achieve, or only may attain for a period of time? I believe that families can achieve that desired state of normalcy, but I also believe life is meant to be challenging and that it throws the occasional curve ball. We go through tough times like job loss, poor grades, unpaid bills, societal demands, health issues, jobs away from home and other events that disrupt our daily lives and routine and impact our mental, emotional, physical and spiritual well-being. I do feel the need to distinguish between trials and challenges in our life that are unpredictable, and the trials and challenges that are self-inflicted due to choices. I also feel that families need to be less judging of themselves through their expectations, and come to love and accept who they are and what they can do. We sometimes get caught up in what we can’t do and our weaknesses that we forget to see our strengths. We especially get caught up in comparing ourselves and our family to others. As individuals and families we have immense potential, and maybe in order to reach our potential we need to have periods in our life that build character. So let’s be proud to be part of the 96%. And maybe those families that I see are actually normal, average, usual and typical. They are just like any other family, experiencing a challenging point in life. It's time for me to get rid of my dog. According to a survey of Canadians on Match.com showed that dog owners are more likely to have had a one night stand, 55% to be exact. However dog owners are also more romantic in the sense that they are likely to spend $40-50 on a first date, and that 77% believe in a soul mate. What is a Random act of Coolness? Go here to find out. Click here to see the original clip. When does anxiety become problematic in a child’s life? Anxiety has been the number one issue for clients I have been seeing. What has been interesting, however, is that the anxiety being reported, which they are truly experiencing, is normal experiences by the body and not abnormal or clinical. Anxiety is the body’s natural way of preparing itself to respond to a perceived, or actual, threat or fear. When this threat has been identified, the body is then able and ready to react in the flight, fight or freeze responses. Children experience anxiety in many different ways. Some of the physical symptoms are: increased heart rate, nausea, shortness of breath, stomach aches, sweating, headaches, dizziness, muscle tension, insomnia, diarrhoea and restlessness to name a few. In the brain, anxiety may provide less access to memory, a decrease in verbal comprehension, and lead to poor planning abilities. The Science of Happiness: Study of Cute Aggression by SoulPancake. Psychology Today recently published a piece on communication. When you look at the communication diagram, and add that research shows 93% of communication is non-verbal coding, I can understand why there is a lot of miscommunication in our world, and especially in digital messaging. It truly looks intentional that they miss the warm up shots, but still, this is great to see. This is an award winning video about Carly's experience with Autism. I am someone who believes in methods that Virginia Satir and John Gottman propose, in that if families cannot talk about surface topics calmly they cannot talk about deep desires and hopes. Gottman has a questionnaire that is often found in his books or as a deck of cards, called the love map. Couples ask each other basic questions about favourite trees, food, ice cream, and moments. This is sometimes done in with a counsellor and they observe whether or not the couple can communicate at this level. If they cannot, interventions are done to get the couple to communicate on that level before going deeper. If couples can talk about surface topics, they are more likely to be able to go deeper and discuss hopes, wishes, and desires. However, the love map, while effective, may not be family friendly. Satir developed something called a thermometer reading of the room. In which there are five levels of family communication depth which can help determine how a family is functioning. But better yet, this thermometer can be used to help families get to the core and discuss. Appreciations or Excitements. This is a time when a family member can share what they are excited about, who or what they appreciate, or who they want to thank. Worries, Concerns or Puzzles. Families can wonder together about certain puzzles that are occurring within their family system, or concerns that they are seeing in an individual or a trend. New Information. This is a chance for family members to share something that is new to them, a new decision, a new goal, etc. ; whatever is information that will be new to the family. Hopes and Wishes. Just start statements with ‘I wish that…’ or ‘I hope that…’ When families can get down to their core hopes and wishes, it influences what they appreciate, worry about, complain about, how they solve problems, and what they are willing to share as new information. As families learn to take the temperature of their family unit, the better grasp they will have on how everyone is feeling and doing within the family system. I would encourage weekly or biweekly check-ins, or at least once a month to allow members of the family to share their perspective. A study showed that Swedish women do 66% of the housework. In Greece women do 80% and in the United Kingdom women do 70%. In Canada, according to a Stats Canada study, women do about 58% of the housework. This takes me back to a previous post about labour division, where I pointed out the quantity of hours worked by males is higher than females. But I think this time it would be worthwhile to break it down to percentages. It is almost on par for Generation Y in terms of an equal distribution of labor. So I find the new study around housework, while an issue overseas, isn't as much of an issue here in Canada, and we should celebrate it. One of the first key developmental crisis for humans is to attach to a caregiver, primarily a mother. Sometimes that secure attachment doesn't occur, and then there are toddlers, children, teenagers and even adults still seeking for that security. New research found that infants who spent one night a week (or more) away from their primary caregiver (typically a mother) were less attached and therefore have an insecure attachment. Living arrangements of those 18-31 have sure changed since 1968. I am not at all surprised at the slight increase in living at home, nor the "other" living arrangements. With more and more of this generation going to college and university (and the cost associated to that), it is cheaper to live at home, or to share costs of living with roommates. 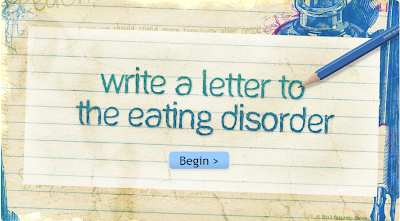 The Kids Help Phone has released a cool page to their website where visitors can write a letter to the eating disorder. 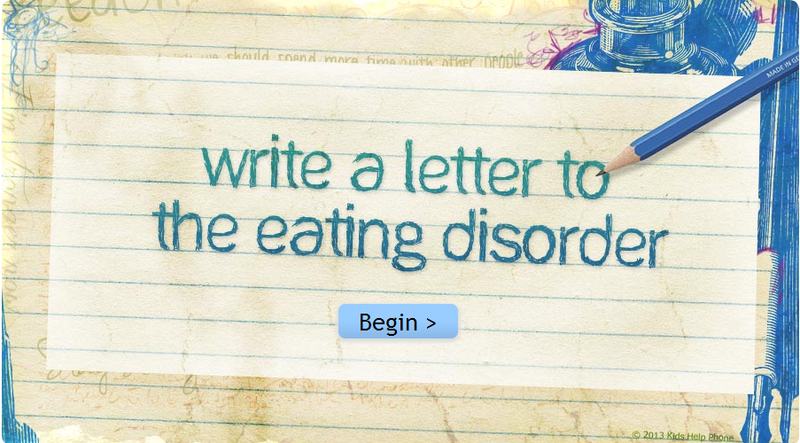 This letter building tool is intended for people who identify as having an eating disorder and want to get better. The purpose is to help point out the impacts of the eating disorder on your life, and to help pull out some of your strengths and to reflect on what keeps you going. Some questions might be hard to answer, and that's okay. It might help to have support from someone in your life, like a caring adult or a counsellor, as you go through the letter. It's okay if you only get partway through – it might take more than one sitting to complete the whole thing. Comedian Kevin Breel shares his experiences with depression.